What is the role of insurance companies/advisors? What can employers do for employees living with arthritis? Arthritis Consumer Experts members are taking a growing interest in the private health insurance market. 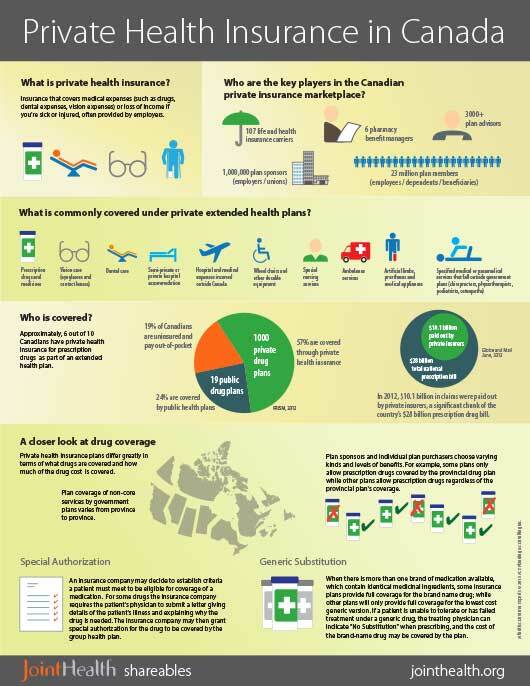 More than 23 million Canadians depend on private insurance to cover their prescription medication costs. "Approximately 6 out of 10 Canadians have private health insurance for prescription drugs as part of an extended health plan." Nearly all – 9.4 million workers and their 13 million dependents – rely on employer-sponsored private health insurance plans; while another 339,000 self-employed workers purchase plans for themselves and their 424,000 dependents. The high prevalence of arthritis and impact of certain types, such as osteoarthritis, rheumatoid arthritis, and ankylosing spondylitis, are placing increasing pressure on plan sponsors (employers/unions) faced with dramatically growing number of arthritis medication claims and risks associated with absence and disability costs. An insurance company that issues policies and promises to pay benefits. A provider of services, including claims processing, home delivery services, and benefit-design consultation (e.g. prescription drug coverage) for insurance carriers, third-party benefits administrators, the public sector and other organizations that provide health benefits. The holder of a group insurance, group benefit policy, group pension, or group savings plan. It can be any organization that provides group benefits to its members (e.g. an employer, union or association). The person insured under a group insurance, group benefit policy, group pension, or group savings plan (e.g. an employee, union member or association member). A person who is licensed by a provincial or territorial regulator to sell life insurance, accident and sickness insurance, group insurance and segregated funds. Also called an agent or a broker. Case management of drug claims: Insurer reviews physician's proposed treatment plan to ensure it's "reasonable"; identifies alternative treatments; monitors adherence; limits payment. Preferred pharmacy networks: "Requiring" consumers to purchase from specific pharmacies. Therapeutic substitution: Private plan recommends/requires that patient uses a different drug than the one prescribed. Tiered formulary: Some plans require patient to use a cheaper drug than the one prescribed through tiered formulary where the patient will have to pay a higher percent co-pay for selected drugs. Special authorization: Most major insurers have a special authorization process for selected drugs, including biologic treatments, which might delay the access to optimal treatment for a specific patient. One in six Canadians has some form of arthritis. Close to three in five people (58%) with arthritis are under 65 years of age, which has significant impact on participation in the labour force. One out of every 136 Canadian workers lives with rheumatoid arthritis; that will increase to one in 68 workers by 2020. The ability for plan members living with arthritis to have meaningful conversations about their unique health challenges with their healthcare professional – from family physician pharmacist to occupational- and physio-therapists – is vitally important to address absenteeism and presenteeism focused on medication management. the proportion of patients with chronic disease who are non-adherent to medications. the proportion of medication-related hospitalizations due to non-adherence. estimated annual cost of nonadherence in Canada (in 1995). Private health insurance companies have the potential to be leaders in Canada promoting prevention and patient-focused treatment and care of arthritis. With a comprehensive understanding of arthritis in the workplace, insurance companies and advisors can provide plans with fair access to medication that ensures the plan member receives the care needed to maintain productivity, while reducing overall absenteeism and presenteeism in the workplace. Arthritis is the most common cause of work disability in Canada, resulting in both poor quality of life and workplace limitations. Of particular relevance for insurers is the category of inflammatory arthritis (rheumatoid arthritis, ankylosing spondylitis, psoriatic arthritis and gout), which affects approximately 2.8% of Canadians. Rheumatoid arthritis (RA) strikes more than 272,000 people, approximately 1% of the Canadian adult population, which will increase to 1.3% over the next 30 years. Approximately 0.74% of the employed labour force, or 1 in 136 workers is suffering from RA. Within a generation, this will increase to 1.5%, or 1 in 68 workers. Within ten years of disease onset, up to 50% of people living with rheumatoid arthritis are work disabled if untreated or undertreated. Other forms of arthritis affect about 4.6 million (approximately one out of every six) Canadians, which is expected to increase by nearly 50% in the next decade. There are currently more than 4.4 million people living with osteoarthritis. of Canadians living with arthritis have not told their employer. As a result, these employers and employees are unable to work together to develop positive plans and approaches that make sense for both of them." Within a generation (in 30 years), more than 10 million (or one in four) Canadians are expected to have osteoarthritis (OA). There will be a new diagnosis of osteoarthritis every 60 seconds, resulting in almost 30% of the employed labour force (one in three workers) having difficulty working due to OA. In addition, approximately 500,000 Canadians will be suffering with moderate to severe disability due to osteoarthritis. While arthritis consumers are able to contribute mentally, their joints are in severe pain and they are likely to leave the workforce earlier than planned, including going on disability (18% within five years after diagnosis and 27% within 10 years after diagnosis). However, employers can work with their employees to create a workplace more conducive to people who have arthritis. Offering an ergonomic assessment of a workstation, including providing an adapted workstation if necessary. Providing an adapted workstation to a sufferer of rheumatoid arthritis makes them 2.5 times less likely to be work-disabled. Allowing employees living with arthritis to adjust work hours and work from home if possible when needed, particularly when they experience an arthritis flare. This includes flex-time and virtual work, which allows employers the benefit of their employees' expertise, while accommodating urgent medical needs. Disease-modifying anti-rheumatic drugs (DMARDs) can decrease inflammation, pain, swelling, stiffness and fatigue, and also decrease the average days lost from work per year from 32 down to 12 (the equivalent of one work month). The earlier that employees begin DMARD treatment, the more effective the treatment results. Biologic response modifers can slow the progression of rheumatoid arthritis and prevent long-term disability. Employees treated with biologics take less time off of work and are more productive. Physiotherapy and occupational therapy are important in ensuring employee health and help them be productive and active in the workplace. Allowing purchase of arthritis medications from pharmacy locations that are within close proximity to beneficiaries helps improve access for arthritis patients who experience mobility challenges/limitations. Educating employees about the signs and symptoms of arthritis and letting them know what support is available to them, including the employee benefit plan. Working with employees who live with arthritis. These employees consider work a way to meet a number of personal needs, including a sense of usefulness, identity, and self-confidence, in addition to financial needs. These employees tend to be very creative in finding potential solutions for accommodating their physical needs and very loyal and committed to understanding employers. "Whether it is with an infographic, video, or text, ACE looks for new ways to share healthcare information, research and policy in a way that is interesting and easy to understand. Our new program, JointHealth™ shareables, presents important health issues in one easy-to-navigate page."